MAR/APR 2019 DISCOUNTED TO $139/NIGHT WEEKDAYS FROM $159!!!! ENORMOUS BEACH & SUN ALL DAY. STUNNING VIEWS of Mt. Rainier, Olympics, Sound and Eagle Harbor. Five minutes by car or bus (regular morning/evening schedule or order ahead) to ferry and downtown Winslow or short walk/bike ride. PLEASE ALSO SEE OUR VIDEO POSTED AS PHOTO #3 PRESENTLY (we have asked VRBO several times to have a separate tab for videos!!). Your suite is approximately 750 sq. ft. and consists of a spacious separate bedroom with a roomy walk-in closet; living room with a sofa group, TV cabinet and a woodstove; a good sized kitchen with a dining table that can sit 6 people and double up as your office table; a full bath. You have a queen bed in the separate bedroom and a queen sleeper sofa in the living room for comfortable sleeping of 4 adults that get along. If you need to fit in some children (or one more adult) there is also a fold-out full size bed (can even fit inside walk-in closet) for guests willing to accept a cramped suite at nights. Also a fold-out baby crib for the small kids. Your waterfront beach suite is within the Wing Point Community, which is one of the most established neighborhoods on Bainbridge Island centered around Bainbridge’s only 18 hole golf course. You have a lawn outside your double french doors that has a fantastic view of both Mount Rainier, the Olympic Mountains, the Sound with ships passing by as far as the eye can see and Eagle Harbor with the ferry and lots of boats jetting in and out. Or relax at the patio dining are or at two other outside seating areas, light up your BBQ or gather around the fire pit! After you book, we send a very detailed Confirmation email with transportation tips, very easy access instructions and what to do on the island. Once you arrive in your suite we also have very detailed instructions how to operate everything in your suite and a detailed guide of restaurants, bars and everything else to do in the neighborhood. Bainbridge Island is the best location to stay at if you want to be close to downtown Seattle but away from the hustle and bustle downtown and at a better price! Go to sleep to the soothing sound of the waves in the well regarded Wing Point neighborhood with a 18 hole golf course nearby. Has a full tile shower and tile around the tub/shower. Shower head with multiple settings and removable. Hot tub, sauna and pool is available at public aquatic center about 2 miles away. Only 50 steps to your own private beach from which you can walk forever at low tide. We are next to the beautiful private Wing Point 18 hole course and can arrange for you to play here. Or the public 9 hole Meadowmeer course is 3 miles away and has a lower fee. Both Mt Rainier and the Olympics can be seen from our property. We supply clean linen and towel change as often as you need for guests staying more than 3 days. We refer you to a downton laundry downtown Winslow for your other laundry needs. We refer you to one of several nearby island health clubs. Very popular feature especially on a rainy winter day. Doors can be opened for a sparkling fire or closed for an incredible heating source. With wood stove, TV, DVR, DVD, etc. Good size 15 cub. ft.
DVR to record shows when you are so you can live your life and watch your desired programs at your convenience. Mostly oldie DVDs. Also recent/oldies pay-per-view movies/shows through our DirecTV service where you leave us a check/cash for the $4 - $6 price/each (some are free) shown on the screen. Two kayaks on our beach that we agree to let you use only at your own risk since we can not assume any responsibility for any accidents. Three different seating areas with tables right outside your suite and more seating on the beach. Two golf courses nearby. 9 holes at Meadowmeer is public and 18 holes at nearby Wing Point where we can arrange rounds for you. There is a 40' long brick gently sloping walkway to the unit from your parking spot. The walkway has four 5' high steps that other wheelchair guests have navigated in the past. The entry french door will open to 6' width and two doors inside suite to the bedroom and bath that are not wide enough for a wheelchair. With this information we hope you can judge if this suite is suitable for you. NOTE: You will find details on all above Amenities below the summary. E.g., the hot tub says "at aquatic center 2 miles away" and not on our premises. Two kayaks, life jackets, etc. on beach for your enjoyment but you need to clean them up and are fully responsible for all safety precautions, etc.. We can arrange a small private party/wedding ceremony (max. 10 - 20 people) in your suite or outside on lawn/beach with a wedding officiant, two witnesses and photographer provided at an extra cost depending on how many people/cars, time of day, etc. We loved staying on Bainbridge Island at this beautiful suite. It was very cozy with the woodstove and the wonderful bed linens. While relatively close to town, it was quiet. We enjoyed the beach walks at low tide as well. Nice place to stay and even a bit of beach combing when the tide was out. Loved sitting in the chairs down by the water and watching the ferries come and go! This 1 bedroom lower level cottage has on old world feel. It has a quaint living space with views of the ferry dock and Puget Sound. A short walk away you can take a picture of the Seattle skyline. The beach access is just at the edge of the property down the stairs. There is a fireplace and seating down near the water for making smores or just sitting by the fire. The town of Winslow is just minutes away. The Clearwater Casino is about 20 minutes away or the 30 minute ferry ride can take you to Seattle. We didn't get to see the mountains as the weather didn't cooperate so I can't rate the view. Overall, very nice setting. 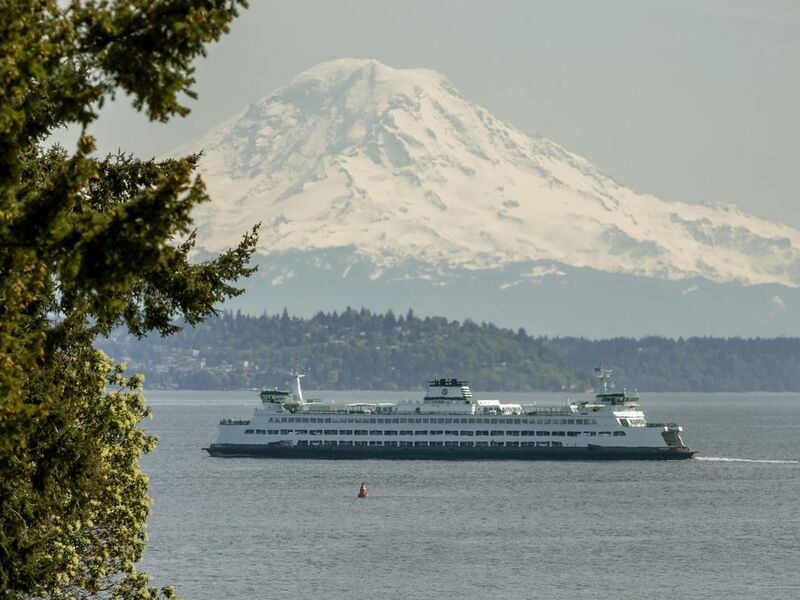 We can assure future guests that the views are FANTASTIC with both Mt Rainier and Olympics visible in good weather besides a good portion of Puget Sound with ships passing by. And the entire Eagle Harbor at your footsteps with ferries and all the boats jetting in and out. We have become so spoiled over 20 years but get reminded how beautiful our setting is by our guests we have enjoyed having over 10 years now! We enjoyed our stay at Abode on the Sea very much. The bedroom was warm and cozy, and the view was spectacular. Watching the ferry go back and forth was amazing. Proximity to Winslow was a plus. We highly recommend that anyone thinking about staying on Bainbridge Island consider this place. Claes and Jenny have an amazing place. Very Private Cozy suite with beautiful ferry, water, and mountain views. My wife and I spent two nights at this beautiful place. it went very well. Owner was very kind and helpful. Thanks and Happy New Year!